Your heart was stirred and you responded with enthusiasm, determination, and focus. But that was so long ago, you barely remember the call. In fact, you’ve begun to doubt it. Did you really hear God? Is He in this? Has He given up on me or changed His mind? You accepted the job, anxious for advancement and to put your unique giftedness to use. Oh, the plans you had! But after ten years of doing grunt work, watching others get promoted, get raises, while you remain stagnant, you’re beginning to wonder… God, do you see me? Do you care? Doing the right thing simply because it’s the right thing. Many of us long to be used by God, and when we consider this, I think our minds often jump to something grand. We long to be missionaries or to start a ministry, or perhaps lead our entire office to Christ. But what if God called you to poverty… for Him. To give up everything to align yourself with the destitute and spend your days begging on the street corner? This is the modern day equivalent of what Ruth did. She gave up everything to align herself with Naomi, to take on Naomi’s plight, and to spend the rest of her days, in essence, begging for food. Pause for a moment to read Ruth 2:1-17. Notice, Ruth took initiative. She offered to go out into the harvests to glean grain from “anyone who is kind enough to let me do it” (v. 2). She humbled herself and served her mother-in-law in a grueling and demeaning position. In essence, she became a beggar. Notice, she didn’t play the poor-me card, bemoaning her situation, asking Naomi to join her. Never once do we read the words, “Why me?” coming from her mouth. I believe that’s because she was entirely focused on the needs of her mother-in-law. Ruth truly loved and honored Naomi above herself. In gleaning, not only did Ruth willingly take the position of a beggar, but she also potentially put herself in harms way. She, a defenseless woman voluntarily worked among hired hands; male strangers. We can sense the potential danger in this through Boaz’s words in verses 8-10. “Boaz went over and said to Ruth, ‘Listen my daughter. Stay right here with us when you gather grain; don’t go to any other fields. Stay right behind the young women working in my field. See which part of the field they are harvesting, and then follow them. I have warned the young men not to treat you roughly.‘” (Ruth 2:8-10a NLT). Boaz would not need to warn his men not to treat her roughly unless he knew this was a common problem. Nor would he need to urge her to remain in his field unless he knew gleaning in other fields, among other strange men, could be potentially dangerous. I believe Ruth understood these dangers as well, and yet, with courage, she set out to do the right thing. Even when it was hard or frightening. Here we see the depth of her love and sacrifice. In these chapters, we also see her perseverance. Harvesting grain was a grueling endeavor, one that exhausted the strongest of men. Hours spent in the sun, backs bent, hands rubbed raw by the rough sheaves of grain. Then, once the sheaves were gathered, they had to be winnowed then ground into flour or roasted. Through all this Ruth persevered, not knowing what lay ahead, not knowing that every step of surrendered obedience was leading her to her calling. Sitting with a neighbor even when it seems no one notices. Serving in the nursery week after week, even though you’re tired. Pouring your heart into a blog no one seems to be reading or perhaps editing a manuscript your certain will never go to print. Going to work every day, giving your all, even though your boss credits your efforts to another. Raising your children or grandchildren, wiping snotty noses day after day, even if it means struggling financially. While your neighbors hold prestigious jobs. Faithful in the little things, doing the task, whatever it is, that God has set before you today. Remaining in God’s will, even when it’s hard, tiring, or lowly. Following His leading, trusting in His timing, even if the drudgery drags on. And on. Surrendering your plan for God’s. This past Sunday our youth pastor, Robert Conn, gave an excellent message on trust and surrender. The sermon is titled “Practically Trusting.” I encourage you to listen to it by clicking here. 1. What stood out to you in today’s passage? 2. What do you believe were some of the external challenges Ruth faced during her period of gleaning? 3. What do you believe were the internal challenges she faced during her gleaning? 4. Can you share a time when you served out of obedience and it became difficult or tedious? What do you believe God was doing during that period? In what ways did that time of service help develop your character or grow your faith? Each of us are called. God invites each of us to seek after and embrace the abundant life Christ offers. But oftentimes in our journey, we hit numerous roadblocks, set backs, and long winding valleys. It is our choice to give up or persevere. Hold tight to your call. Hold tight to the One who called you. Share your thoughts here, join the discussion on Facebook, or join our Bible study email loop. Make sure to visit Beth’s blog FirstHalfDay on Friday for another discussion on surrender. This entry was posted in Beyond I Do study, Faith, grace, intentional living and tagged Boaz, call, obedience, perseverance, Ruth 2. Bookmark the permalink. 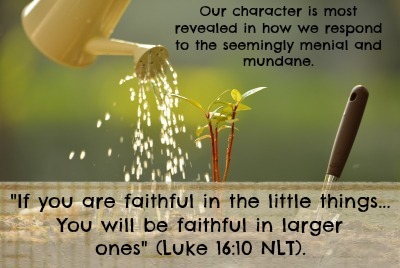 I love the reminder of Luke 16:10…Good reality check for me as I strive to figure out the next step in life. I think as a woman Ruth had to have feelings of stress, strife, weariness, felling lost and confused. But she remained obedient. My lesson on Friday will focus on the mundane and will tie right into your lesson on surrendering your plan for God’s plan. That is not always an easy thing to do. Thanks Jen. Whenever I read that verse, I also wonder… can we hinder our walk by being unfaithful? If we’re not faithful to do that which God calls us to now, whatever it is, will that hinder our receiving greater responsibility? I gave that last question a little thought and I would have to say yes. I believe when I know I am being unfaithful my walk gets tarnished. I look back at the times where I new I was being unfaithful in my obedience because of fear and yes, it robbed me of receiving a greater responsibility but more importantly, it robbed me from a greater blessing. I think responsibility, obedience and blessing can go hand in hand. Can you imagine what could have happened if Ruth did not walk in obedience ignored God and was unfaithful? Yikes! That’s a little reminder to me that I have to stand firm on my faith and trust even when I just don’t get it. Love your ending phrase about trusting even when you don’t get it. That’s when trust is hardest, isn’t it? But maybe also when it’s most important. I hadn’t thought of that! Wow, she really had a lot stacked against her, didn’t she? Praise God He was bigger than every challenge, danger, and prejudice she faced! (I’m reading your post for Takin’ it to the Streets right now. Greater is the One who’s in us! 🙂 ) I look forward to reading more of your thoughts. A friend, Julie Arduini, had some inspiring thoughts on this passage as well. I plan to share hers on this blog on Thur.